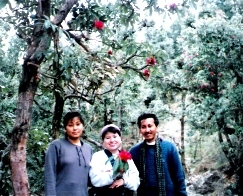 Enjoy Soft Adventure Treks, Heal your soul with Green Earth activities, Enjoy Alpine Flora & Fauna of Dharamsala India !! Camping at Triund! Mountain Bikes ! The 'Himalayas' or 'HIM-ALAYA' means "The Abode of Snow" straddle across the Northern face of India. From the very start of mankind the mountains have beckoned him, inspired him, given refuge and challenged him. . The mountain chain of the Himalayas; bounded in the North by Tibet, in the North West by Jammu & Kashmir; to its South lies the plains of Punjab and to the East it is bounded by the Garhwal Hills of Uttar Pradesh. Dharamsala, situated in the Kangra Valley surrounded by the Mighty Dhauladhar Range or 'The White Ridge' is an intergral part of the Himalayas! The height varies from 4500 metres to 5500 metres, this Outer Himalaya has an area of 4066 square kilometres. Kautilyas 'Arthashastra' provided the Laws relating to forestry and wildlife preservation. For centuries, we have looked up to the Himalayas for their blessings, revered them , enjoyed their beauty and sometime in our personal ambition and growth..have thrived to become taller than them. Heal Green..is a prayer dedicated to the Himalayas. Our endeavour, is to create 'carbon-free' environmentally friendly, soft adventure activities which are in harmony with the flora and fauna of the mountains and mankind. Rock climbing,mountain picnics,para gliding,camping at truind..! Soft Adventure treks...In Green Dharamsala! The best traditional way of discovering the mountains is by exploring the hidden trails leading to it. There are many such soft treks for young n' old, here in this valley. One of the most popular 09 Kms trek, is from Dharamsala to Triund (2875 m). This 03 hours trek is full of sights , flora and rejuvenation. 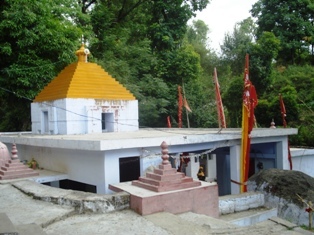 The midway Galu Devi temple and the Dharamkot Village is a wayward experience. The Moon peak is a spectacular view from here and the night views of Dharamshala town below! Day Treks are very popular in areas of Kandi village and surrounds. Enjoy soft adventure of Village treks.. In Dharamsala there any many ethenic communities living together in harmony in all the villages in the hills. An excursions in these villages gives a good insight of their culture and their way of living, faith and green earth traditions. The 'Anjani-Mata ' Green Village trek, will take you to this ancient hidden shrine of the Holy Mother of the Monkey God - Hanuman, Energy manisfestation of Lord Shiva...the God of the Universe. Eye-Feasting soft adventure.."Bird Watching"..a passion ! 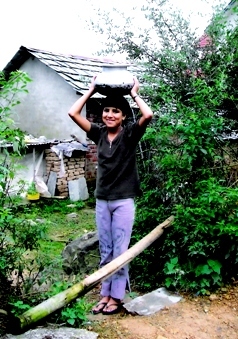 In 2004, one of our early guests of Vidya Niwas presented my daughter with a pair of binoculars. 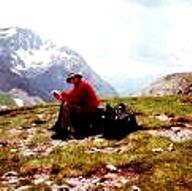 He was an earnest bird-watcher and loved the hill walks and the beautiful himalayan birds he discovered on his way. 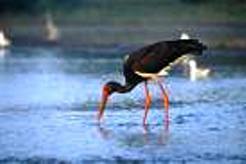 Bird watching excursions add a real jest to your vacation here in Dharamsala, India. We recommend a day trip to the Pong Lake to view these rare migratory species. The Wild Life Soft Adventure in Dharamsala.. Enjoy a day out with a naturalist and Himalayan wild life. 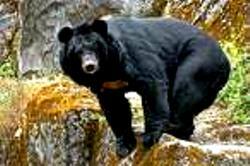 The Himalayan Black bears, Leopards, Sambhars, Deers can all be part of an exciting vacation in Dharamsala. If you are fond of outdoor angling..then there are some exciting river beds near Dharamsala for trout fishing. 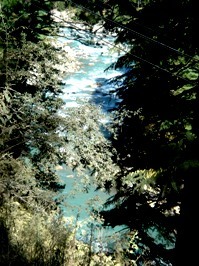 Barot river, near Palampur is great where angling is done more for fun by Tourists. After the thrill of catching, the fish is returned back to the river..a different holiday high in the Himalayas ! Energize yourself with Mountain biking around the Villages and the Green Kangra Valley. A cycle ride will take you back to history lanes..Chai/Coffee Chats and a great unforgettable day, in Dalai Lama town of Dharamsala.Mountain Bike Excursions can be organised. Nature Study Walk.. Flora Trek in the Himalayas ! Nothing can be more interesting and pleasing to the senses than taking a nature walk in the hills, discovering the unique flora of the Himalayas. The fragnance of these rare alpine flowers lingers forever in your life. 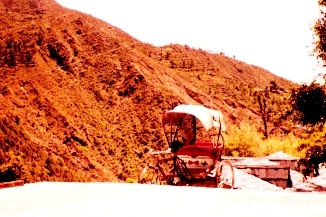 If you want a joy ride across the Kangra Valley, you can discover it with your own pony...a company for a day ! Outdoor Camp...An adventure with Yoga energetics! A fresh air outdoor camping is a rejuvenating experience..indulge yourself in a Yoga & Meditation camp in the aromatic air of the Himalayas in Dharamsala India. 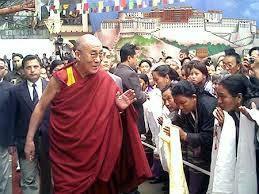 Attend H.H The Dalai Lama Teachings with vedic cooking classes. Take your date with nature with us ! The Himalayan Para-Gliding...an adventure of a Lifetime. Enjoy the lovely scenic views of the Kangra Valley while you are in the air...an unforgettable experience in Dharamsala India.
" 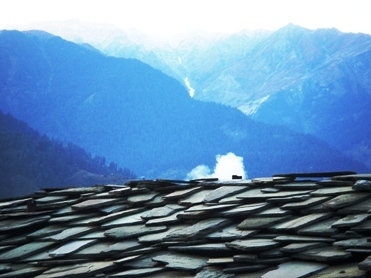 There is a roof in the Himalayas...where the snow melts down ..and a rivulet appears to bring life to Mankind. " For a green soft adventure trek..take the Dalai Lama Tour..Click the Graphic below ! For more on Soft Adventure in Dalai Lama Abode...Homepage!! It was a morning of miracles, as the monsoon mist drifted away, giving birth to a clear sky. 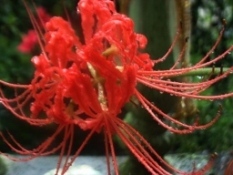 Our Fire Lily was a blaze and striding with success !.." how many of us can boast of catching the dew drops before they slip away "! Mist n Miracles..Even as we were enjoying the sunlight, the ancient Shiva cave..devotees and flowing conversation, there came a drifting cloud and when we asked for blessings we were drenched ! Rain, rain and rain..soggy sandwiches did not seem the menu for the day. ..Bits of cricket news, a wooden shack, old benches and hot chai (tea) with fresh fried pakoras dripping with mustard oil ! Old newspaper is excellent as paper plates, soaking the oil and allowing us to dip our sandwiches in sweet n sour tamarind chutney (sauce). Everything thing had a divine touch of (heaven), the flavor on our tongue, the raindrops which would not dry on our wet hair..and so much more. What started with a miracle ended with one..the small beetle, heavy with the weight of its wet wings made it to the other side of the road, in the sweet shelter of the bush !.. "Life does not happen as we want it to..but, the miracles don't cease" !! **Your Date with Nature...CONTACT US !